This is a vent. Be warned. Do you tell new people that you meet that you have a blog? Do you give out your blog address first thing? I don’t. Some people I’ve spent a lot of time with do not know that I keep a blog and was never really told. I have been accused of not taking pride in my blog because of it, but that is not why I sometimes keep quiet when blogging comes up. My present diary, the quote Carpe diem quam minimum credula postero is by the poet Horatius and it means Seize the day, trusting as little as possible in the future. Because even though I don’t write an everyday diary online (I keep those personal thoughts in my personal diary notebook), I feel that the more I post the more personal it is to share it with “new people”. Do you understand what I mean? My art is personal to me even if I want to share it online. I take pride in my writing, because I love to write. It makes me truly happy when I’m told that my posts inspire you to create something. Sometimes though it feels like I let those new acquaintances peak into my head when I don’t get access to their brain. It makes the relationship uneven and a bit scary to me. And sometimes the opposite happens. I reveal where the blogs at but then never get a comment back. And then I worry. What did they think about it? Feeling a bit sad, thinking they didn’t bother visiting at all? Or didn’t get it? I know I pre-judge people sometimes, not thinking that they could “understand me” or all this. It’s kind of like when a child shows her newly created painting to her busy parents who doesn’t notice it’s importance. Or what a gift the sharing really is… Sometimes that just hurts. 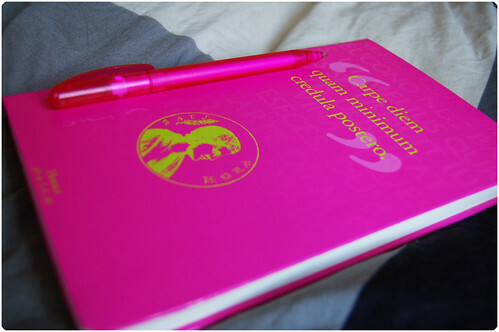 My magenta colored diary Carpe Diem. Love this cover and the quote! Most of my visitors are close friends (who doesn’t comment very often) and other bloggers that write on similar subjects. At least those are the people I know off, because you comment so kindly! Thank you! There are lots of visitors who never make themselves known to me of course. But in real life I still find it difficult to explain who I am when it comes to art. There are so many concepts that are unknown to most people in my surroundings, and I am so many of those things – at least in my mind. For example, what the hell is mixed media, art journals, collage, online classes, art exchanges, mail swaps, flickr, wordpress, bloglines, vlogging, twitter, ravelry, self-publishing, etc, etc. How about you? What’s your thoughts on this subject? Do you tell everyone? Do you brag enough? And what to do with those people that will never understand what you do? Keep trying or give up on explaining why you’ve got glue on your fingers and acrylic paint between your toes? This entry was posted in Digital Life, On writing and tagged blogging, confidence, introvert, sharing. Bookmark the permalink. I dont really tell anyone either.I dont really mind sharing my personal art with people I know cause Art is a big part of me and i ONLY come WITH ART not without .So its not really a issue with me wether to tell them about my blog or not as far as my personal art is concerd.But generally I dont say unless they ask what my art is or if they do art to then i do tell them.But mabey i should as i hardly get any comments on my blog(sob)…..
Like you, I don’t like to tell everyone. My coworkers don’t know about my blog (except for one, who showed interest in knitting), and I don’t feel comfortable letting everyone know. I even deleted my website address from my Facebook profile when I began receiving invites from people with whom I was not comfortable to share what I do. I’ve been a silent visitor of your site for a very long time. I ran across it because I was seeing your name mentioned on many of the blogs I visited and curiosity got the best of me. It turned out that your blog is one of my most favorites to visit – one that I make sure I have no distractions so I can actually absorb what you are saying. So thank you for that and for coming back to the blogging world! I don’t blog as often as I would like, but when I have time I do share my work on my blog. No one I know in real life (except maybe my husband) knows that I have a blog. It is something some people may run across or that know me from an online community. I have my blog posted on my facebook account, but honestly I’ve been uncomfortable with it there since many people don’t know what I do. I make art because I can’t stay sane without it, it’s a part of me. But I make it at home when I have time alone and tend to keep it to myself. Sorry, I’m babbling. There’s nothing wrong with being quiet about it with people you know in real life – the important part is that you do share it and that there are people in the online community that appreciate your posts. Hi Hanna, you should be proud, because you just don’t talk about crafting or journalling you talk about life and how not to be afraid to try new things. I am not an artist, I cannot even draw but I am drawn to your blog because you encourage us to try new things. I love reading all those links you shared with us. I am thinking, how can one be so young and have so much insight? You make your parents proud and I salute them! I hang with many of you, me too find uncomfortable to share my blog in real life. I would like to show my art to people who have similar interests. My art do not fit to my offical, working me. I am struggling very much to say honest, meaningful, genuine words and not to hurt myself or my dear ones. Or not to say anything that someone can use against me at work or future work. And it is frustrating! What is meaning of the art if I sensor myself all the time?! This is very important issue, thanks Hanna for taking it up. I once gave my blog address to someone where I worked. I got in trouble because of something I wrote and lost my job. It wasn’t anything, no names etc, but they still fired me. We have freedom of speech but not the freedom to work and blog. So do be careful. I use the delete button more often and never give out my blog address to anyone who doesn’t already know me, how I express myself etc. I have been reading your blog for quite awhile and you get me to think about my art and my life. thank you. Oh, I feel the same way! I told my closest friends when I started, but they probably glanced at it once. LOL. They don’t really care about mixed media. I was just telling someone today that I am SO new in this journey that I don’t believe anyone that says they like what I am doing unless they are a complete stranger. They have no biases towards me. I am also an introvert, too. I don’t tell a lot of people. Of my 12 or so coworkers, only one knows about my blog. And she’s the new girl! Some people, you just know they’ll “get it” and others won’t give a flying hoot about it. Like you, I don’t tell some people about my blog because they don’t need to know that side of my person. And, I believe, they don’t WANT to know it. I’m one of the “silent” people who often drop by without commenting but I’m always inspired by your art and writing. I too am selective about who I tell that I have a blog. Most people just don’t get it so I just do the things I enjoy…art, photography and writing…for my own pleasure more than anything else. My online contacts on the other hand, really do get it and I love the connections that I’ve made through blogging! I seem to be in line with the rest of the group, I dont tell people I blog….my close friends, they might look at it once in a blue moon, because they are not interested in mixed media, art. But besides that just my family, and they dont even look at it. Is there a stagima attached to blogging, I dont think so. But if you tell someone about a blog you might have read…they just assume that person does not have a life. They do not know how authentic a life can be led by having a blog and having a meeting people who are of the same mind as you are. I am a frequent visitor of your blog. I came across it on Michelle Wards blog. Your blog is a real inspiration to me. I also don’t tell people that I have a blog, I don’t tell that I make things either(I don’t dare to call it art). For me it is fantastic to see what other people like you make and think. Most people want that everything has a purpose or goal and I don’t know how to explain to them that is is mostly for myself that I create. It makes my life richer and it makes me feel happy. Thank you for your wonderful blog, I hope to visit it often in the New Year. My best wishes for you and your family. That’s interesting because I’m exactly the same. I’m an introvert too, and I don’t write personal things on my blog but it’s like my private world still and I sort of want to keep the internet and real life separate. I haven’t told anyone about my blog, but my parents know I have one. I think maybe it’s because I don’t know anybody with an interest in craft, and they wouldn’t get my blog at all and probably think I’m rather odd! oh, i know exactly what you mean. sometimes i part of me wants to share my blog – my thoughts on life, things i hope will inspire, photos, art, experiences.. – and part of me is too shy to open up to “new” people. i absolutely love you and your blog. i’ve been following for almost two years, i think, and you have inspired me in so, so, so many ways, including creating a blog of my own. i admire you so much and would love to meet you someday! i think we’d be great friends. I’m pretty sure a lot of this has to do with being an introvert. I really don’t know *how* to field the questions and comments I get from people who aren’t good friends and who aren’t into crafting, so I prefer to keep quiet. And, I’m protective. But the extroverts I know don’t get it and think I should be out there bragging. Thank you again for posting this. I’m so glad someone else understands. Hanna, I feel sad reading this that I dont’ leave comments more often on your blog. I know so well the feelings you describe. You post something that is very close to your heart or something you’re proud of and then no one says anything, and it makes you wonder if anyone saw it, and if so what did they think? Since I know that feeling, I should be better about leaving comments on my friends’ blogs. I apologize that I have not commented here more. I tell anyone that seems that they might want to know, that I blog, but very few people in my real life visit it, since none of them are artists or very interested in art. am another of your silent visitors, when I read your post this morning I felt, wow, I am not the only one feeling like this. Yes Hanna it is the response that matters. Sometimes that response is positive and sometimes can be negative, and sometimes indifferent. I believe it’s not about me or my blog or my work, just that sometimes people who don’t, don’t understand and don’t know how to respond. I did told quite some friends of mine. But they seem not to look. They also don’t comment. Strange feeling. If a friend of mine would blog at least I would fly over the posts every week, even if the topic doesn’t interest me, because in my blog there is also quite a bit of my life. With collegues I’m very careful, because it’s my private life. I do blog about part of my business, being a teacher, but just on selected topics, eg art, crafts. With more or less strangers I’m much more less shy, same as in online world. Because they don’t know me in “reality”. But most of the people don’t know about blogging life. I love your blog although I#m not into mixed media. Because I know how good a comment feels I have the habit of commenting on your blog and on others that I like as much as possible. It is a matter of telling how much I appreciate the effort somebody else puts into her blog. Because that is what I do. Have a very good time on your travel. Btw. where are you heading to? I completely understand! My blog is my place and sometimes I too only want people who are interested in the topic to view it. My sister sees it, but she already gets me. I feel like I want to share it when it “becomes great” or when i “become great”… however just so you know, your blog rocks and I check it out from time to time because you really inspire me to want to be a great artist and to keep exploring… Thank you! i found your blog through wishstudio and am so glad to find it/you! i appreciate your ponderings on how we share our blogs (and LOVE your colors and how you play and how you are beautiful and how you mention acrylic paint between your toes!!!). i just began a blog in october and find that sharing my he(art) is very personal, even though i do so publically! i haven’t figured out the balance yet of when and whom i share my blog with, but am grateful to be in good company with such discernment!! i just wanted to say I enjoy your blog all year long and just wanted to wish a wondeful time this holiday season. Thanks for all the wonderful gifts you give in your blog all year long. I’m definitely a closet blogger. I want to preserve my blog as a place that I’m free to say what I want…if I want to rant against some crazy insanity in the world than I’m free to do it without worrying whether or not someone I know will judge me harsly for my views. I was very impressed reading your post about this issue. You are so fantastic to describe feelings and thoughts. My english is far too bad to write so nuanced about my own thoughts. But one thing I want to tell you: On my blog I can follow new postings from bloggers I have added – when you have made new postings these are the ones I seek first. ALWAYS inspiring and creative. You make me want to keep on following the creative way in my own life – allthough it is often difficult with minimum of time. I too am a closet blogger. I do not share it with anyone I know personally. I didn’t even tell my own family about it for a very long time. I found you because I started an art journal last year and this is one of my favorite places to come to for info but more importantly inspiration! Thank you so much for sharing your heart and soul with all of us, who come here to be inspired! I feel exactly that way myself, often. I only share with people that already have some of ‘all this’ in common, maybe we meet at an art or a photography event, or I know they journal. I do think it is the introvert thing in my case, the self-protectiveness, the privacy. Sometimes it even limits my blogging, and that is truly sad. I think that is okay, you don’t invite everyone into your home, why not apply the same filter to your online home? I do tell people. Usually it comes up some way or another, because my blogging and my art work is so much a part of my life. I have the same thing you do though, sometimes I worry about showing too much of myself. Or thinking perhaps people won’t like what they see? Sometimes my reaction to that is to not tell people, other times I tell them straight away, just giving them a head’s up where it comes to who I am (still time to get out of this deal). But mostly, it just comes up when it comes up. All my colleagues know about it, and pretty much all of my friends. Some of them found out by themselves (my colleagues) others I told (my friends). But yeah, I don’t think many of them ‘understand’. My colleagues often don’t ask about or comment on it, although I know they’re reading (I can see the company server address in my stats) and to my friends I am ‘the Internet-girl’. Now, I know this is an endearing term to them but it also annoys me. I don’t want to just be the ‘weird one’ with the blog and the art. I don’t want to have to explain every time why I keep an art journal and why I post about some things and not about others. So part of the reason I tell new people about my blog is that I hope to meet people in real life that have a blog and are into the same things. Basically, to meet some ‘online friends’ in real life. It has worked once or twice, I now have two friends that blog and are also into art and design. Wow, well, sorry for this rant, but I can just really relate to what you’ve been writing and it’s an issue I’ve been thinking about for a while. Do I want people to see the ‘whole’ me (including the blog), or would I rather keep a distance? And if so, why? Hi Hanna. You’ve been quite eloquent on this topic. Like you I am very introverted and for many years, I didn’t admit, even to myself, that I am an artist. It’s not something I spend a lot of time talking about, especially since my day job is at the opposite end of the spectrum from art. I find that I don’t want to “market” myself, and that’s how I see those people who are so good at putting themselves out there, proclaiming their space in the blogosphere. At the same time, I’d love to be able to build up a presence so that someday, maybe, I could make a living, even a meager one, from my creativity. I do talk to people I work with now about my creative endeavors and some of them even visit my blog on a regular basis. The downside of that, is that I have to edit what I say, and not just because of my coworkers, but because my family also reads my blog… so that stuff ends up in my journal, where it really belongs, anyway. Happy New Year! I used to visit your blog very often, but quit flickr/reading blogs for a year and now I added you to my Reader, because your collages are always so inspiring. I don’t tell people I put pictures on flickr or have a blog (since yesterday ;)), they’ll find out when they’re close enough. And I never give my real name or put a picture of me online. I like the idea of having strangers read what I write and visit me. I also decided to sort of stick with general stuff related to my life and creativity. I think you touched on the fear I have or have had in that the people I want to read it are those who are interested in the same things and have the same passions. Sometimes we don’t share the same passions with the same people and we don’t feel the need to share I guess?